Our face is one of the most exposed areas of our body. Our facial skin is far more sensitive for having to deal with the effects of the sun, the wind, the rain, as well as dust, and airborne pollution. There is also the effect of low humidity or high humidity and the drying effect of indoor heating and air conditioning to contend with. That is a tremendous weight for our skin to carry- and so we need to purposefully practice good cosmetic care so that we maintain the essential balance of vitamins and minerals, which support and protect our skin. As we age, our skin tends to dry out even further and this, combined with the environmental impacts, is what causes a loss of elasticity and is the source of wrinkles, crow’s feet and laughter lines. Of course, eating well and staying active help to replenish us with nutrients and the immune system benefits that we need but cosmetics are the finer details that rest on the foundation of good nutrition and exercise- for skin radiance and keeping skin conditions and aging skin at bay. Value is a small 5-letter word that inherently means so much. It is what we value that we pay attention to, love and care for, get passionate about, and exert our energy to protect and uphold. Think about what you value. We should of course value our skin; it is our protective shield and our reflection of health and harmony to ourselves and the outside world. So, invest in your own value- through care and kindness and buy products that support your values and uphold your integrity. There are so many cosmetic products to choose from that it is easy to lose ourselves and head for a quick fix toward our objectives, but when we patiently serve ourselves we can gain so much more. Some ways we can do this is by knowing what we are buying; checking ingredients and sources of those ingredients, and if you are against animal cruelty and testing then seek out products that match those values. Adaptability is something we aren’t great at most of the time because we do love our comfort zones and our beauty routines are habitual. Adaptability is life’s key ingredient. Adapting our beauty and skincare regimen is vital because we need different types of protection for varying seasons and weather. Alongside this, our skin goes through many changes as we age- we cannot use the same products from our 20’s as we approach our 40’s and 50’s. Check your products to ensure they meet the needs of your skin; our skin may become more sensitive due to biological changes as well as environmental ones so we should modify our skincare accordingly. Aging is inevitable but if we can combat the aging process and protect our skin, and doing so through (and kinder) means then we can win our way toward better, healthier looking skin. Beauty Without Cruelty is passionately fueled to create great cosmetic products based on this foundation. In 1963, the trustees of BWC Charitable Trust, an animal welfare organization, founded Beauty Without Cruelty in England. Its goal was to manufacture and distribute color cosmetics that were NOT tested on animals (as was the norm) and did NOT contain any animal ingredients. The driving force behind the project was Katherine Long, a dedicated, life-long animal welfare activist, a cosmetician, and a vegetarian. Together with Noel Gabriel, Katherine developed the first, full line of cruelty-free color cosmetics. After Katherine’s death in 1969, Beauty Without Cruelty almost closed its doors but Lady Dowding, a founding trustee, was determined to keep the company and its purpose alive. Lady Dowding, a warm, open-hearted person, was a charismatic leader and BWC continued to grow and influence others. In 1978, after tireless efforts, Lady Dowding appointed Joseph Piccioni as managing director of BWC. Joseph had considerable business experience and was dedicated to animal rights. He contributed his expertise, vision, and personal assets to develop BWC into one of the most sought-after cosmetic brands in Great Britain. In 1989, Beauty Without Cruelty was introduced in the United States. Based on the principles of high quality, fair pricing, and environmental sensitivity, BWC cosmetics quickly became one of the industry’s leading brands. Later that year, a skin care line was developed to compliment the color line from England. American consumers making it one of the most respected and recognized lines in the marketplace embraced its cruelty-free, vegetarian ethic. Today, Beauty Without Cruelty has a full line of cruelty-free, vegan skin, body, and hair care products made with the finest ingredients and aroma-therapeutic essential oils, and a full line of color cosmetics to meet the needs of every woman. Beauty Without Cruelty has developed a number of targeted facial moisturizing creams to aid in moisturizing the skin and renewing that fresh, youthful appearance that has been compromised by aging and environment. 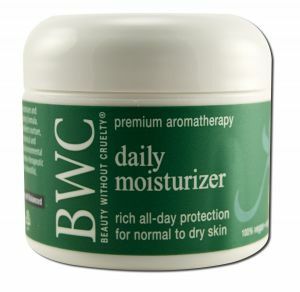 The BWC Daily Moisturizer provides rich, all-day protection for normal to dry skin. This product can be utilized on a daily basis to provide continuous moisture and protection to the face relying on a blend of Shea Butter, Almond Oil, Safflower Seed Oil and Macadamia Nut Oil, along with essential oils and herbal extracts to nurture, protect and revitalize the skin. Effective botanical and vitamin antioxidants help offset the impacts of the elements, leaving the skin fresh and radiant. The delicate scent is provided by a combination of essential oils, in particular, ylang-ylang, geranium rose and lavender. Herbal extracts of Pellitory Root, Arnica Flower, and Cucumber Fruit provide additional benefits to the skin. BWC Vitamin C Renewal Cream with CoQ10 has a soothing and deep-moisturizing action with its emollient base and anti-oxidant protection, along with Coenzyme Q10, known for its supportive action. 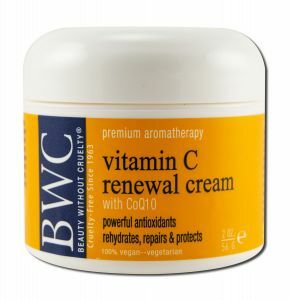 BWC Vitamin C Facial Renewal Cream, with CoQ10, moisturizes, conditions, and revitalizes skin. Active Vitamin C and CoQ10, with green tea extract and antioxidant vitamins, help neutralize the impact of the environment, by moisturizing and nurturing the skin, enhancing a youthful appearance. Powerful humectants replenish needed moisture to smooth, soften, and pamper your skin. The product features Aloe Vera for its soothing effects, as well as rich plant emollients Sunflower Seed Oil, Rosehip Oil, Tamanu Oil, Almond Oil, Cocoa Butter and Flax Seed Oil. The fragrance is provided by essential oils of Neroli, Sweet Orange, Ylang Ylang, and Lavender. Herbal Extracts of Chamomile, Calendula, Green Tea and Cucumber provide additional benefits. BWC is “leaping bunny” certified and has maintained its leadership in the worldwide effort to ban animal testing of cosmetics. BWC is also known for the high quality and effectiveness of its products and has a large and loyal customer following as a result.